This next phase of globalisation needs to deliver economic growth so that it is equitable: Nadella. 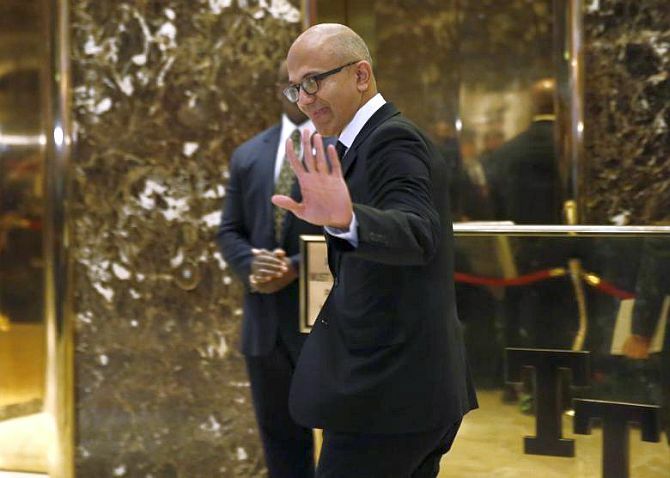 Microsoft CEO Satya Nadella on Tuesday said the next phase of globalisation needs to deliver an economic growth that is equitable for everyone so that there are no places with people without food and there are no refugees in camps. Addressing a plenary session on 'Shaping Globalisation 4.0' at the WEF Annual Meeting along with other co-chairs of the summit, the India-origin business leader said a real need all have today as a global community is to drive the economic growth that has stalled. "We need to get back to the core challenge of economic growth. This next phase of globalisation needs to deliver economic growth so that it is equitable. We have a dual challenge going forward," he said. Nadella said the fourth industrial revolution also needs to deliver on technology and innovation that can drive economic growth. Aristizabal, who works to engage young people with the skills they would need for the future, acknowledged the "learning crisis", a problem in the education system. “When we are talking about the global situation, we have to understand we have to fix the learning system, the education system. If that is not fixed there will be a huge humanitarian crisis," he noted. Julia Luscombe said she recognises the privileges she has had growing up in the US but that she also saw deep-seated inequities growing up in Chicago. Feeding America, her organisation, serves 40 million people in the US facing hunger and food insecurity, which is a pressing issue across the world, she said. She also called for a more equitable future to make sure everyone has the food they need to thrive. Akira Sakano said she comes from a small town in Japan, which suffers from young people leaving in droves. Her town has committed to becoming "zero waste" by 2020. Mohammed Hassan Mohamud said he is a refugee from Kakuma refugee camp in Kenya. He has been there for more than 20 years of his life and lives there with 185,000 other refugees from 10 different nationalities. He is zonal chairman, Kakuma Refugee Camp. He asked would his siblings have to grow up in a refugee camp. "I don't think it is fair and I shouldn't have to beg for a home... We are not asking for much. I'm just looking for a place to call home," he said. Other co-chairs are Basima Abdulrahman, Founder and CEO of KESK Green Building Consulting, Akira Sakano, Chair, Board of Directors of Zero Waste Academy Japan, and Noura Berrouba, Member of the Governing Body of European Youth Parliament.